Every year as spring turns to summer, the quiet castle town of Matsumoto in mountainous Nagano prefecture is transformed into the craft capital of Japan. Crowds of people come from afar to celebrate the work of several hundred of the country’s leading craftspeople at the two-day Matsumoto Craft Fair. Since its humble beginnings in 1984, the fair has become the biggest and most prestigious of a growing number of open-air craft fairs that take place across Japan annually. 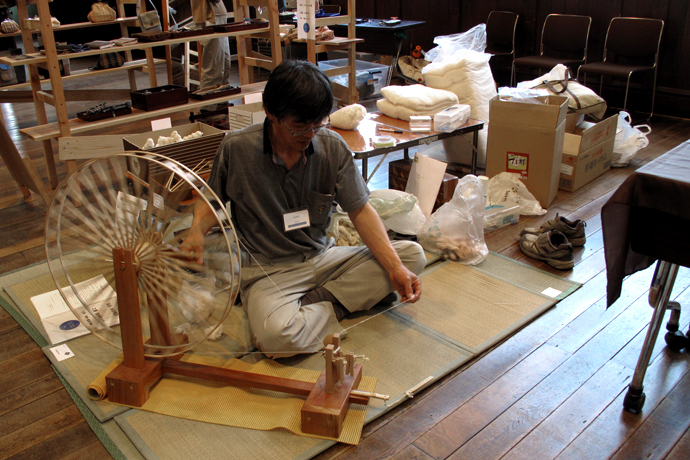 Although the Matsumoto event showcases the work of approximately 260 craftsmen, the competition for places is fierce, which means that entry standards are very high. Only 1 in 5 of applicants reportedly are accepted to participate. 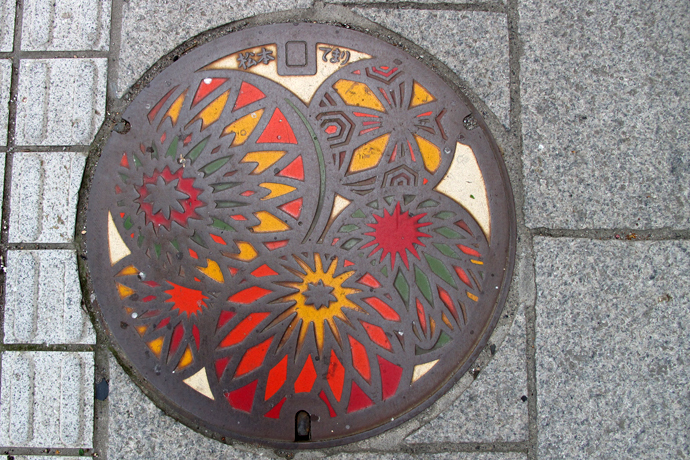 This brightly colored manhole covers in Matsumoto depicts the town’s famous craft, temari. embroidered balls for traditional ball games. Such attention to detail seemed quite appropriate for the town that hosts the largest craft fair in Japan. I experienced the excitement of the most recent craft fair in Matsumoto on the final weekend of May 2013 when I, along with 250,000 other craft enthusiasts, made the two and a half hour pilgrimage by train from Tokyo. At the train station, I was welcomed by an advertising banner announcing “Matsumoto Craft Month” (kougei-no-gogatsu). The success of the craft fair has contributed to the growth of the city’s tourism and it now organizes numerous craft related events and workshops throughout May that builds up to the climax of the main craft fair at the end of the month. 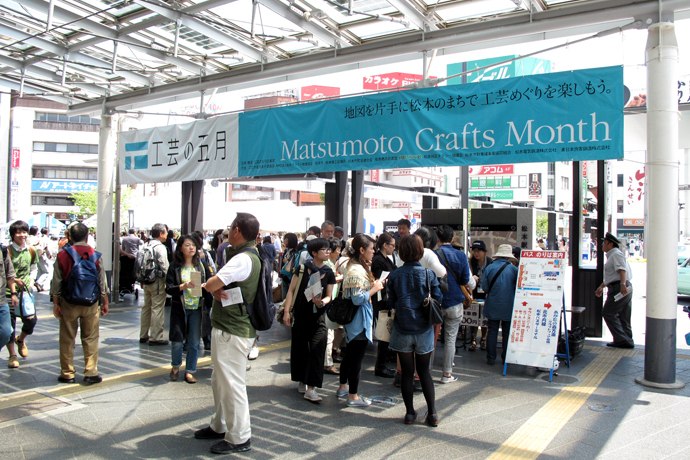 A banner advertising Matsumoto Crafts Month welcomes guests at JR Matsumoto station. It takes around 20 minutes to walk from the train station to Agata-no-Mori Park where the show is held. This 15-acre sprawling park is lined with tall Himalayan cedars and houses a beautiful historic school building. 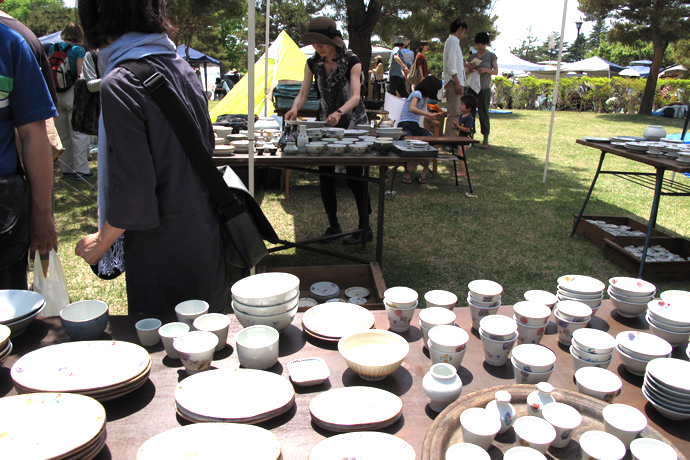 By the time I arrived in the late morning though, the park’s promenade was tightly packed with the biggest crowd that I have ever seen at a Japanese craft fair. The atmosphere was festive and everyone seemed excited to be there. 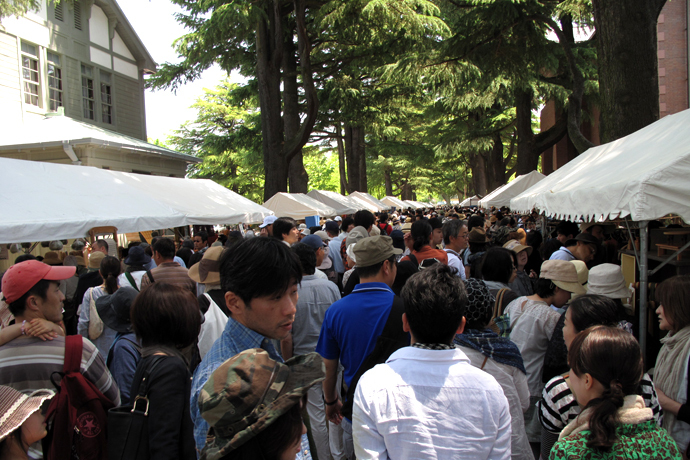 A large crowd packs the Agata-no-mori Park promenade at the Matsumoto Craft Fair. Each of the stalls that I visited displayed beautiful and truly unique work. Besides the exceptional quality on show, another characteristic that differentiates this fair from others that I have visited was the sheer diversity of crafts on display. Of the 260 stalls, approximately 80 were ceramics, 50 wood, 25 glass, 25 textiles, 20 metal, 10 leather, 4 apparel, and 40 other miscellaneous outlets. This “others” group included stalls selling raw materials, tools and even books related to crafts that I have not seen elsewhere. Additionally, there were 40 stalls brimming with food and drinks that made the fair an event that one can enjoy for a whole day. Another unique feature of the show was its serendipitous design. The participants choose where to locate their stalls on a first-come first-serve basis. There was no map to locate where a favored craftsman might be found, so there was plenty of incentive to go around as much of the show as possible to see what was on display. I really enjoyed this element of surprise, which allowed me to wander through all the stalls without the distraction of intent. After a while, I noticed that the end of the park was far less crowded than the entrance, so the next time I come here I will start at the end and work my way back to the front of the park. The makers Kobayashi Katsuhisa, Ito Akinobu, and Sakai Mika, whom Studio KotoKoto has introduced to the U.S. were also participating in the show, and it was very exciting for me to see them again at such a prestigious setting. Woodworker Kobayashi Katsuhisa’s stall on the promenade of Agata-no-mori Park. His shaker-style cherry tea boxes were sold out in just 30 minutes. Potter Ito Akinobu and his young family at the Matsumoto Craft Fair. This is a fun weekend event for participants and their families. Nerikomi potter Sakai Mika at the craft fair with her husband. Her stall was located towards the end of the park. 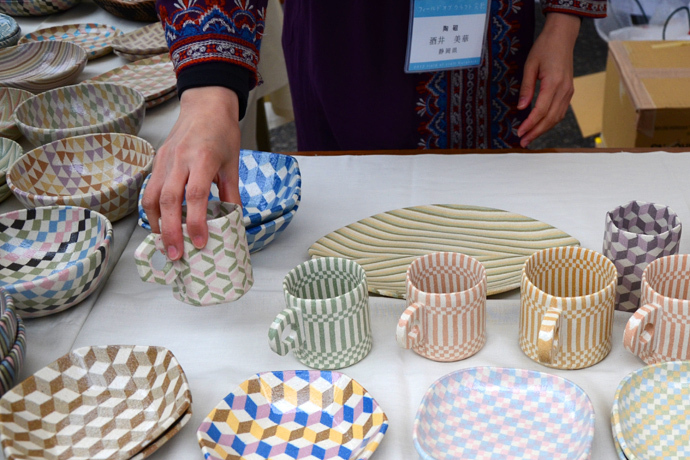 With its sterling reputation and huge popular appeal, it is hard to imagine that the Matsumoto craft fair has only been running for 29 years. It normally takes many more decades to become so renowned. The fair was founded by a small group of dedicated craft artists after one of its members was inspired by craft shows that he had witnessed in the U.S. and the U.K. He proposed starting a similar outdoor event in Matsumoto where the fans of handmade crafts could meet their makers in a fun environment. The Matsumoto fair will celebrate its 30th anniversary in 2014. 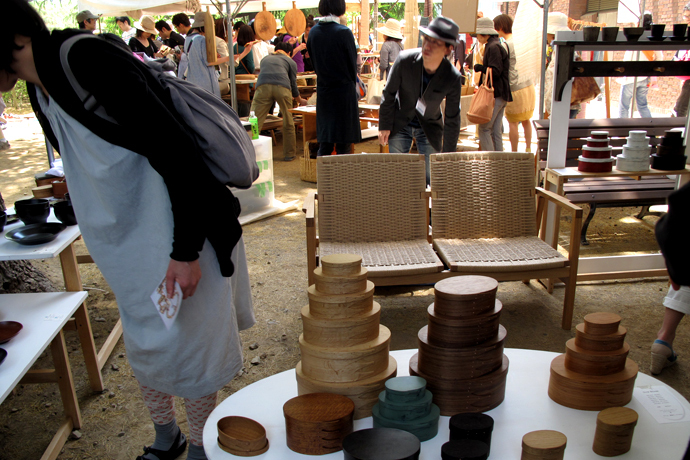 If you happen to be in Japan during the last weekend of May and want to see what the very best of the country’s young and talented crafts makers have to offer, this is the place for you. Just bring your enthusiasm, a hat, and a comfortable pair of shoes. Sunday March 3rd was Ohinamatsuri, or Girl’s Day, in Japan when we celebrate the health and well being of young girls. In a country where so many seasonal celebrations are male focused, it is a refreshing change and a special day to recognize the contributions made by women in Japanese society. It is also a day to enjoy the wonder of Girl Power, Japan-style. In thinking about the place of women in Japan, I looked into the relationship between women and craft. According to the World Economic Forum’s 2012 Global Gender Gap Report, Japan ranked a disappointingly low but not surprising 101st of 135 countries in the gender gap index (*The updated 2017 Global Gender Gap report ranked Japan 113rd of 144 countries). It is embarrassing to see my home country hovering so far down in the rankings and well behind other major developed states. The U.S., for example, stood in 22nd place while Nordic countries dominated the top 10 (*the U.S ranked 49th in the 2017 report). In the old and rigid world of Japanese traditional craft, it seems that we continue to be bound by male-dominated hierarchies. Japan’s Ministry of Economy, Trade and Industry designates traditional craft products and certifies master craftsmen in their effort to promote and preserve traditional Japanese crafts. As of 2011, there were approximately 4500 certified master craftsmen, of which less than 600 or 13% were women. Despite these grim statistics, in the more globalized and populist contemporary craft community that Studio KotoKoto is a part of, we have come across many successful and vibrant female artists in Japan as well as the U.S. 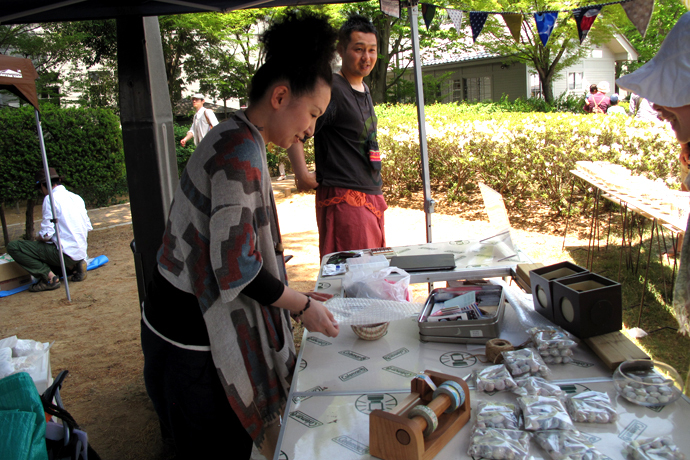 Talented and successful Japanese nerikomi ceramic artist Sakai Mika showing her work at a show in 2012. Mika’s work can often be seen at department stores and galleries across Japan. My visits to several craft shows in Japan over the past year offer a simple insight into how successful and influential Japanese women artists have become. In all of these high quality juried shows, roughly half of the participating artists were women. I also found that a large majority of visitors to these shows were women and they also were the biggest supporters of these artists. Many women travel around the country to visit artists and purchase their work. Moreover, while many Japanese male artists are quiet and rather insular, I have found that Japanese women artists are very open and willing to work with us in California. So on Ohinamastsuri, I salute all of the fearless Japanese women artists that have made Studio KotoKoto such a wonderful and fulfilling experience. At least in the world of contemporary Japanese craft, girl power is a phenomenon to be reckoned with. The most remarkable aspect of Takami Yasuhiro’s baskets is the stunning beauty of every bamboo splint woven into them. Their evenness and glow create lines that are refreshing to the eye, and give his work a unique air of grace. I met Takami-san in May 2012 at a special exhibit of crafts in a Tokyo department store. It was sheer luck to be able to meet this soft-spoken artist in Tokyo, because he is usually based in Yufuin city, Oita prefecture, in the southern island of Kyushu. He has been using bamboo to make a wide range of items from small trays to large ceiling installations for over 30 years. When I saw his work, I was enamored by the contemporary look of his baskets that cleverly featured bamboo segments. Usually the segment part of the bamboo is trimmed off because it makes it more difficult for the artist to weave the splint. I loved that Takami-san uses the segment in his work because this, in my view, is the most iconic and beautiful part of bamboo. Takami-san manually splits every bamboo splint (called Higo in Japanese) using traditional tools and methods. It is hard to imagine the amount of patience required in splitting and matching the width of the splints. Being adept at splitting bamboo is the most important skill for a basket weaver, because the beauty of each splint determines the appeal of the end product. It is said that this skill alone takes three hard years to master. When asked why he chose to become a bamboo basket weaver, Takami-san simply said that “I wanted to become a person that absorbed all aspects of bamboo”. What I think he meant by this statement is that he deeply cherishes the qualities that makes bamboo special and has striven to emulate these attributes in his work: the importance of endurance, flexibility, strength, and continuing maturity. Takami-san seems to have successfully achieved his long-sought goal after spending three decades in mastering this highly demanding craft. He passes on this gift to us in his spectacular work. Do you think food only looks good and tasty in plain-colored, uniformly mass-manufactured vessels? At Studio KotoKoto, we believe that appreciating and enjoying the vessels that contain the food should also be an important and fun part of the dining experience. We want people to ask not only what is on the plate but also who made the plate. In this food blog, we want to inspire the notion that food and craft are inseparable by offering ideas and thoughts about this relationship. To do this, we will feature a handmade piece by an artist and suggest a dish to go with it. 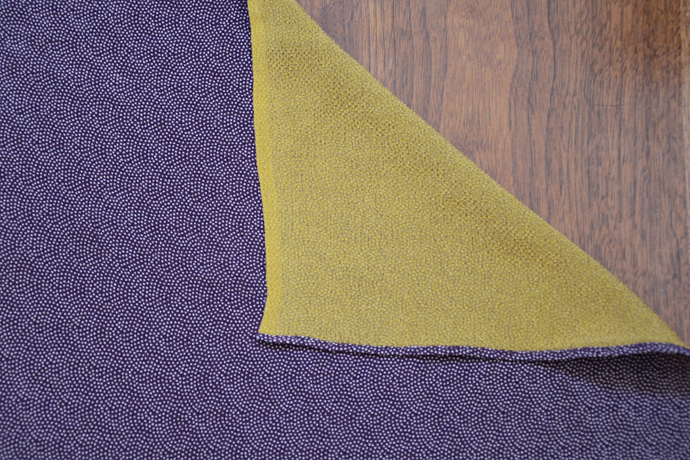 Today we are using a double-layered mesh (ajiro) woven bamboo tray by Takami Yasuhiro of Chikuseikan*. The refreshing summer look of this vessel is perfectly suited for plating delicious, bright appetizers, and so we decided to serve shrimp and avocado canapés. A simple chip and dip recipe with a fine dining twist by Ai makes them really attractive! Put the avocado in the blender and add lime juice. Take the avocado paste out of the blender and mix in garlic and cilantro. Salt and pepper to taste. Boil shrimp and put in ice water to cool. Pat them dry. Add lime juice, cilantro and coat with olive oil. Salt and pepper to taste. Brunoise red onion. This will be the “wow” factor of this dish to show your knife skills so spend time to make them nice! Coat this with a little olive oil also. Now all the parts are ready to build the canapé. Pipe out the spread onto corn chips. Scoop some brunoise red onion on top. Position the shrimp on top of the spread. Garnish with a leaf of cilantro.